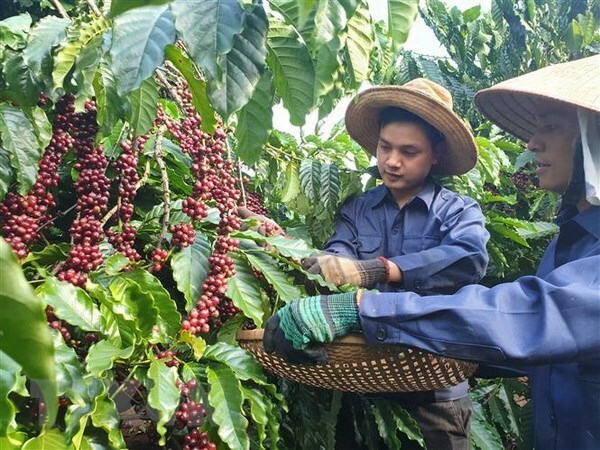 Lam Dong (VNA) - The Vietnam Sustainable Agriculture Transformation project (VnSAT) has proven effective in the Central Highlands province of Lam Dong, helping enhance coffee production effectiveness in the locality and change local farmers’ awareness of sustainable coffee farming. Local farmers have been supported in building infrastructure facilities and purchasing equipment for cultivation and production. In the last three years, training courses on cultivation technique were offered to some 10,000 farmer households in Lam Dong. Hundreds of sustainable re-planting and production models and water-saving irrigation models for coffee were formed. Attention was also paid to developing cooperatives, aiming to promote production and consumption links. So far, the project has provided more than 33 billion VND (over 1.4 million USD) for developing infrastructure facilities, rural roads and storehouses in Lam Ha and Di Linh districts, as well as and Loc Phat and Loc Thanh communes in Bao Loc city. VnSAT’s management board said it will continue to implement sub-projects on infrastructure, production device and water-saving irrigation in Bao Lam, Lam Ha and Di Linh districts, and Bao Loc city. The sustainable coffee cultivation area in the Central Highlands region reached 22,000 ha, exceeding the set target, with profit growth 4.5 percent. VnSAT began in December in 2015 in eight Mekong Delta localities: An Giang, Dong Thap, Hau Giang, Kien Giang, Long An, Soc Trang and Tien Giang, and Can Tho; and the five Central Highlands provinces of Dak Lak, Dak Nong, Gia Lai, Kon Tum and Lam Dong. The project is expected to help increase the number of agricultural products with export value worth more than 1 billion USD. In the Central Highlands region, the VnSAT project provided advanced technologies to about 63,000 farmers for use on 69,000 ha.